What about you, dear readers? how do you cook salmon? and what spices and herbs are you usually using? UAE is celebrating today its 44th National Day! Happy Birthday to the country, which has become my second home. *You can substitute green peppercorns with white. For the marinade, crush sea salt and green peppercorns. In a bowl combine all ingredients for the marinade. 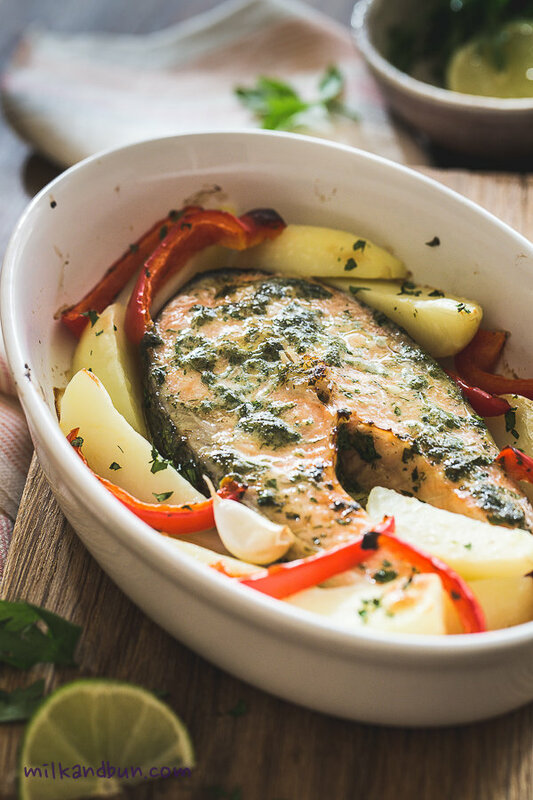 Put salmon steaks in a shallow plate, pour over marinade and leave to marinade for 30 minutes at room temperature, turning once. 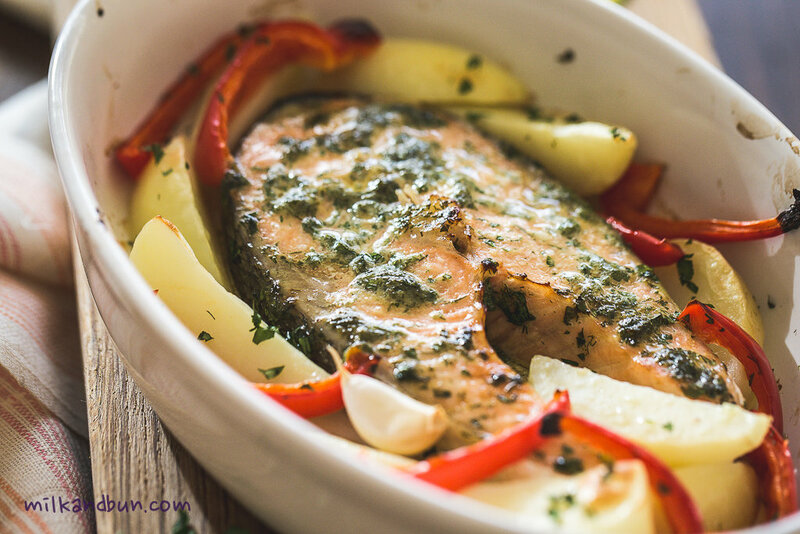 You can keep the fish in marinade for longer, but cover the plate with plastic wrap or foil and put in the fridge until ready to roast. 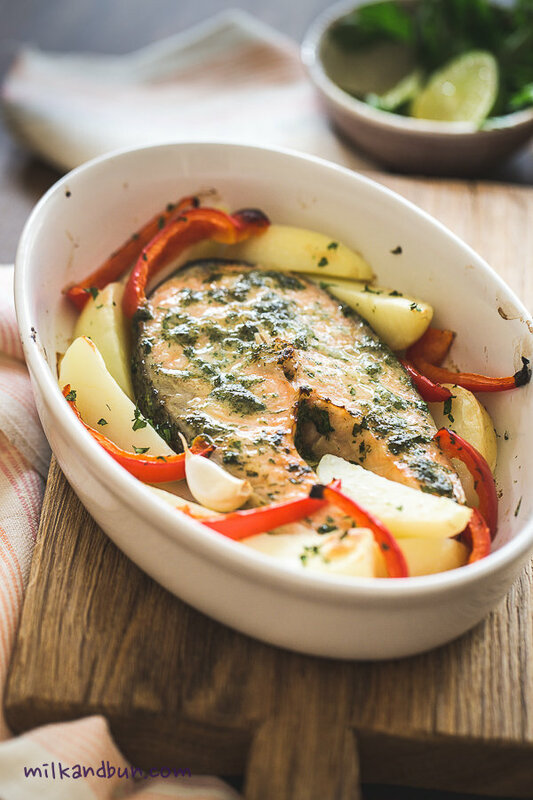 Arrange salmon steaks in a baking dish, add sliced capsicum, potatoes and garlic. Roast for 20-25 minutes. Dec2December 2, 2015 • By milkandbun • This entry was posted in Fish and Seafood, Healthy choice and tagged cooking, delicious, Dubai food blogger, fish, food, food blogger, food photo, food photography, food styling, green peppercorns, grilled salmon steaks, healthy cooking, healthy recipe, herb-marinated salmon, My Life, photography, photos, recipe, roasted herb salmon, roasted salmon steaks, salmon. Bookmark the permalink. Delicious! I love salmon too. Your recipe looks great. Yay! Thank you so much for the nice comment, Linda! Love salmon in any way. But the best cuts for me are those steaks with the bone in. It gives the salmon so much more flavor. Yours looks delicious. Me either, it’s such a healthy and tasty fish! Looks so good Mila especially with those potatoes around the side. I like turning simple tinned red salmon into fishcakes with dill….I have anew recipe coming soon too…. I simply grill it and then drizzle it with a few drops of extra virgin olive oil and lemon juice. Perfection! Absolutely agree with you, salmon itself is so good that it doesn’t require any extra spices or herbs; but sometimes I’m just in that mood to make a complicated marinade or sauce. 🙂 Thanks for stopping by and reading! Yummy Salmon is awesome and this looks so delicious! What a fantastic recipe! My style of cooking, love it!